Rahul’s decision to flee to Wayanad is the other indication that the Congress is now taking on the mantle of the Muslim League. What is it with the Congress? From being a mainstream party, from being a party which has ruled India for nearly 50 years post-independence, from being a party which knows well the levers of power, the complexities of governance, from being a party which has had an experience of adhering to and abusing the Constitution, it has now gravitated to becoming the mouthpiece of separatism and communal politics. At least that is what the Congress manifesto and Rahul Gandhi’s escape to salubrious Wayanad seems to indicate. From being a self-declared party for all Indians, the Congress, under Rahul Gandhi, has shrunk to representing the left-radical fringe, better known as the “Tukde Tukde Gang”. This gang is essentially a cartel which functions in urban and rural settings, within the confines of universities and in jungles and repeatedly calls for overthrowing the Indian state, for junking Parliament and aims at the balkanisation of India. The Congress party’s just-released manifesto is, in fact, a recipe for separatism. It is a document which proposes to dilute our national security apparatus, protect those who call for India’s disintegration and makes it easier for terrorists to get away with acts of terror with impunity. It is laughable to see the Congress—a party which had refused to provide political sanction to retaliation after the Mumbai terror attack—promise to strengthen India’s national security. By promising to bring the office of the National Security Advisor (NSA) under the purview of Parliament, by promising to repeal suo moto the Armed Forces (Special Powers) Act (AFSPA), which will most adversely affect our soldiers in their fight against terrorism, by asserting that it will withdraw the army from Kashmir, by emphasising that it will repeal the sedition law, the Congress has, if not anything else, displayed its unwavering commitment to the balkanisation of India and to the dilution of our collective will—firmed up and best expressed by Prime Minister Narendra Modi in the last five years—to fight terror, to safeguard our borders, to protect our sovereignty and freedom. Rahul Gandhi and his manifesto speak for the “Azaadi” to break India, and not for the “freedom” to preserve, protect and lead India to new heights. One had hoped that with Lieutenant General Deependra Singh Hooda as his security advisor, Rahul Gandhi would have better sense of India’s national security exigencies. 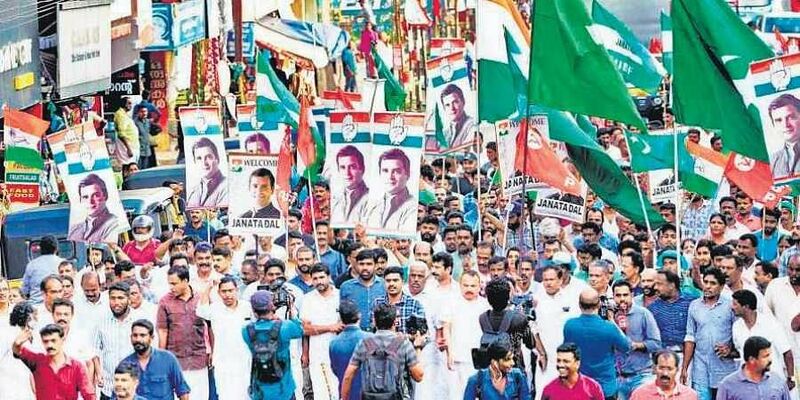 Rahul’s decision to flee to Wayanad is the other indication that the Congress is now taking on the mantle of the Muslim League. Rahul’s decision to stand from Wayanad, a minority-dominated seat, is an acceptance by the Congress that, through its “Hindu Terror” narrative, it has heaped calumny on Hindus, has demonised them in order to consolidate its vote-bank through appeasement politics. It is now unable to face the Hindu electorate. On the other hand, the CPI(M), most of whose leaders have metamorphosed into Congress spokespersons instead of continuing to be party ideologues, was shocked by this opportunism. The fate of the “mighty” “Modi Hatao” front suddenly seemed uncertain. The most articulate exponent of Rahul’s political philosophy began fumbling. This crass communal move by the Congress has unnerved it. What is more disturbing is that the Congress has elicited support of the SDPI, the political front of the rabidly Islamist Popular Front of India. Both the SDPI and the PFI have been under scanner of investigative agencies for arms stockpiling and political killings. It was the SDPI which had in 2014 objected to Vande Mataram being sung in schools in Kerala and had pressurised a number of them to stop the practice. While Modi speaks of a “New India” in which denominational discrimination is passé, Rahul weaves a narrative that harks back to Jinnahism and the politics of partition. Can India afford such regression?